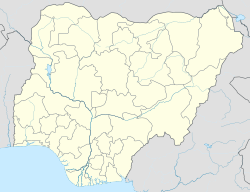 Kaduna is the state capital of Kaduna State in north-western Nigeria, on the Kaduna River. It is a trade centre and a major transportation hub for the surrounding agricultural areas, with its rail and road junction. The population of Kaduna was at 760,084 as of the 2006 Nigerian census. Rapid urbanisation since 2005 has created an increasingly large population, now estimated to be around 1.3 million. Kaduna's name derives from the Hausa word kada, for crocodile (kaduna being the plural form). Kaduna was founded by British colonists in 1913 and became the capital of Nigeria's former Northern Region in 1917. It retained this status until 1967. The first British governor of Northern Nigeria, Sir Frederick Lugard, chose the present site for development due to its proximity to the Lagos-Kano Railway. Sir Ahmadu Bello, the premier of Northern Nigeria (1954-1966), was assassinated in Kaduna on 15 January, 1966 in a mainly Igbo military coup. This event contributed to the Nigerian Civil War (1967-1970). The Nigerian Islamic umbrella association, Jama’atu Nasril Islam, is based in the city. With both Muslim and Christian populations, Kaduna has been a site of religious tension between Muslims and Christians, particularly over the implementation of shari'a law in Kaduna State beginning in 2001. In February 2000, nearly 1,000 people were killed in a riot, and several cars and houses were burned to ashes. The city remains segregated to this day, with Muslims living mainly in the north and Christians in the south. In 2002 some Muslims were offended by an article in a Lagos newspaper about the upcoming Miss World pageant scheduled for that week in the capital city of Abuja; it suggested that if Muhammad watched the beauty pageant he would end up marrying one of its contestants. A massive riot ensued. Churches were among the most frequently attacked targets: More than 20 were burned by Muslims. In retaliation, Christians burned eight mosques. Several hotels were also burned. The city suffered widespread damage, and 11,000 people were left homeless. The local offices of the newspaper that had published the offending article were burned. As a result, thousands of civilians fled the city to escape. Civil unrest soon spread to the capital, Abuja. After four days of rioting, Nigerian security forces quelled the riots and arrested hundreds of rioters. The government imposed a temporary curfew, but although individual killings continued. Some 215 bodies were counted on the streets or in morgues, while others were buried by their families before being counted. 1,000 people were wounded. The funerals of many of the victims took place shortly after the riot ended. Muslim rioters were tried in Sharia courts, while Christian rioters were tried by civilian jurisdictions. The editor of the newspaper that had published the article was arrested. [Isioma Daniel]], the reporter who wrote the article, resigned and fled to Norway. Muslims compose roughly 60% of the population and Christians constitute roughly 40% of the population. Kaduna River promotes the economy of the town. Kaduna is an industrial centre of Northern Nigeria and the Middle Belt, manufacturing products like textiles, machinery, steel, aluminium, petroleum products and bearings. However, the textile industry has been declining because of factory closings due to neglect during military rule and competition with Chinese imports. Automobile manufacturing also remains an important part of Kaduna's economy. Pottery is highly prized from Kaduna, especially from the Nok culture, which precedes Abuja and Minna. Other light manufactures include: plastics, pharmaceuticals, leather goods, furniture, and televisions. Some of the main agricultural exports include: cotton, peanuts, sorghum, and ginger. One of Nigeria's four main oil refineries is located in Kaduna. It is supplied by a pipeline from the Niger Delta oil fields. A 2009 World Bank survey states that Kaduna is one of the top six cities with the highest unemployment. 20% of the population is estimated to be unemployed. The main highway through the city is called Ahmadu Bello Way. Many of the place names come from past sultans, emirs and decorated Civil War heroes. Kaduna has a large market, recently rebuilt after an extensive fire in the mid-1990s. There is a large racecourse Murtala Square, approximately 1.6 kilometres (1 mi) round, inside which the Kaduna Polo Club and Kaduna Crocodile Club are situated, whilst the Kaduna and Rugby Clubs are on the periphery. There are two airports, one of which is Kaduna Airport. Chanchangi Airlines has its head office in Kaduna. Kaduna also has a branch of the Nigerian Stock Exchange. Kaduna is an important junction on Nigeria's Cape gauge railway network. At Kaduna, a branch line connects the Lagos–Nguru Railway to the Port Harcourt–Maidugur Railway. Kaduna is also on the route of the planned Lagos–Kano Standard Gauge Railway, which has been completed between the national capital of Abuja and Kaduna. Trains for Abuja depart from the Rigasa Railway Station in Kaduna. Umar Farouk Abdulmutallab, the "underwear bomber" suspect of the terrorist arson attempt on Northwest flight 253 in December 2009, grew up here and returned to the city on holiday. Fiona Fullerton, British actress and former Bond girl. ^ Summing the 2 LGAs Kaduna North/South as per Federal Republic of Nigeria Official Gazette (15 May 2007). "Legal Notice on Publication of the Details of the Breakdown of the National and State Provisional Totals 2006 Census" (PDF). Archived from the original (PDF) on 5 March 2012. Retrieved 2007-05-19. ^ a b c d "Kaduna". The Forum for Cities in Transition. Retrieved 13 November 2016. ^ Fletcher, Banister; Dan Cruickshank (1996). "Africa". Sir Banister Fletcher's a History of Architecture. Architectural Press. p. 1466. ISBN 0-7506-2267-9. ^ a b c d e "Kaduna". Encyclopædia Britannica. Retrieved 13 November 2016. ^ Isaacs, Dan (2002-12-20). "Kaduna: Nigeria's religious flashpoint". BBC News. Retrieved 2007-04-06. ^ "BBC News - Nigeria Buries Its Dead". 2002-11-25. Retrieved 2009-02-07. ^ "Klimatafel von Kaduna / Nigeria" (PDF). Baseline climate means (1961-1990) from stations all over the world (in German). Deutscher Wetterdienst. Retrieved 14 July 2016. ^ "Kaduna". Columbia Electronic Encyclopedia (6th ed.). ISBN 9780787650155. Retrieved 13 November 2016. ^ "Contacts Archived 2009-12-27 at the Wayback Machine." Chanchangi Airlines. Retrieved on 19 October 2009. ^ Muhammad, Hamisu (23 July 2016). "A memorable trip on the Abuja-Kaduna train". Daily Trust. ^ Nossiter, Adam (2010-01-17). "Lonely Trek to Radicalism for Terror Suspect". The New York Times. 14. "Bikin Sallah: An rufe wuraren shakatawa a Kaduna". Hausa.ng. 2018-08-13. Retrieved 2018-10-22.